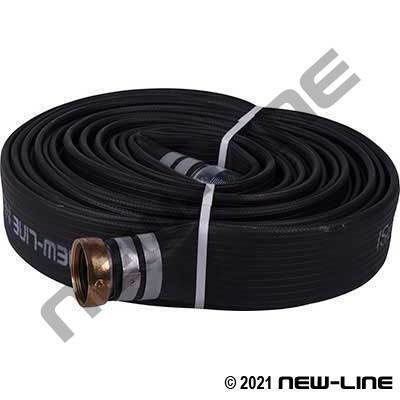 Our popular NL2005/NL2006 can be used as a premium layflat water discharge hose or as a petroleum waste discharge hose (NOT for use with air or for food grade applications). It combines the light, compact features of PVC with the heat and abrasion resistance of rubber. Its ribbed cover reduces dragging friction and resists abrasion, gouging, oil, and weathering. This hose is popular in applications where users consider all around value and ease of handling, however it is NOT designed for the rigours (pressures, pulsating, elongation, forces, abrasion, etc.) of extremely long, continuous applications such as high volume water pipeline transfer (miles or kilometres). It is also ideal for oil spill cleanup (not gasoline) and oil contaminated water, but is NOT recommended for petroleum products having aromatic contents over 30%, or any critical applications with petrochemical fluids. NL2005/NL2006 are also now available in long continuous lengths of 300Ft (suffix X300) and 660Ft (suffix X660). Typical Fittings: Camlocks, N310-AL short shanks, forestry or fire expansion ends (1-1/2" - 2-1/2"), N52 punch clamps, bolt clamps. Construction: Circular polyester yarn, embedded in a black nitrile/PVC blend rubber.